The Big Summer Charity Barbecue takes place this Sunday 19th August. Starting at 5.30pm in the Corner House, it’s sure to be an evening of great live music, food and craic! All proceeds on the day go to charity. See our Big Summer BBQ page for more information. 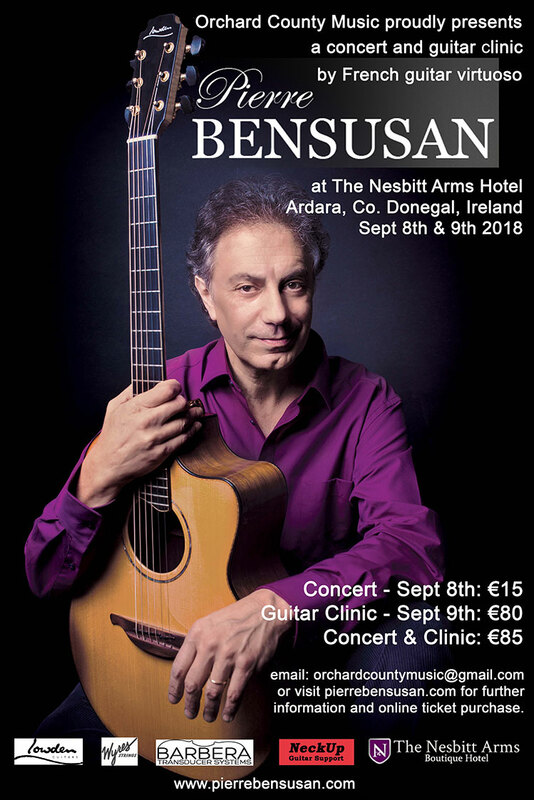 Guitar virtuoso Pierre Bensusan will perform in concert and hold a masterclass at The Nesbitt Arms Hotel on Sept 8th & 9th respectively. Winner of the Independent Music Award, in the Live Performance Album category for his latest triple live album “Encore” (2014), “Rose d’Or” of the Montreux Festival for his first album, “Près de Paris” (Switzerland, 1976), “Best World Music Guitar Player ” by the readers of Guitar Player Magazine (USA, 2008), Pierre Bensusan is recognized as one of the premier musicians of our time. Email orchardcountymusic@gmail.com or visit pierrebensusan.com for further information and online ticket purchase. Bus tour & exhibition exploring the European cultural heritage of Doon Fort & its hinterland. Come share your photos, memories & stories about monuments & built heritage in this area of SW Donegal. Bus tours depart from the Dolmen Centre. Kilclooney at 11am, 12.30pm and 2pm. Teas/coffees & home bakes available at €3.00pp in Kilclooney Dolmen Centre Coffee Dock. Bring your photos of local places in SW Donegal you visited over the last number of decades and share your stories with us. Unveiling of a stone carved townlands marker of Loughros Point, depicting the sixteen townlands on the peninsula. This beautifully hand carved map shows each townland in both Irish and English. Carved by local stonemason Kieran Keeney, this map truly is a work of art and will set in stone the townlands of the area forevermore. Parking will be available at The Church of the Holy Family car park with a short walk to the site. Priority parking at the site for the elderly and disabled. An event not to be missed. Suitable for Children under 12. Wheelchair Access (Full). Car Parking available at Church of the Holy Family car park. Tai Chi classes will be starting September or October in the Heritage Centre.